As a busy mom that’s trying to balance every area of my life, I know how hard it can be to keep your kids and pets healthy and happy. A bottle of peppermint oil is one product that I have to keep on hand at all times because it helps with everything from muscle aches and upset stomachs to bacterial infections and stress relief. I want to share some of these proven benefits and uses of peppermint essential oil with you so you can see how one bottle can save you money by replacing several medicinal, cleaning, and beauty products. It’s a fact of life that kids seem to catch every bug that goes around their circle of friends or at their school. This can lead to nausea, upset stomach, or throwing up. Additionally, the medications they get to treat it can cause constipation or bloat. This can result in a miserable kid that probably won’t want to take any more medicine. You can make a warm tea that is infused with a few drops of peppermint oil for a nighttime drink. Warm up your water, add one to three drops of peppermint oil, and drink it. You can make a simple lotion to rub into your skin to help with your sore muscles. Take your favorite carrier oil and measure out one-quarter of a cup. This can be coconut, jojoba, sweet almond, or whatever one you choose. Put it in a double boiler or in a small bowl in hot water. You can add up to 10 drops of peppermint oil when the carrier oil is melted. Let it cool for one hour before you rub it into your sore spots. Combine the quarter-cup of white vinegar with the 15 to 20 drops of peppermint oil. Pour this mixture into your spray bottle. Fill the remaining space with water, and you’re ready to clean with it. You can also combine three drops of peppermint oil with a cup of Epson Salts and put it in your bath once or twice a week. You’ll get the aromatherapy benefits as well as the muscle relaxing benefits that comes with this oil. Do you have frequent breakouts or acne that just won’t go away? Peppermint oil can help to clear up your skin by killing the bacteria and stripping away any excess oils with its antimicrobial properties. (9) This can lead to less frequent breakouts, a reduction in the amount of acne present, and healthier, glowing skin. You can make a simple bug repellent by mixing 10 to 15 drops of peppermint oil into 8 to 12 ounces of water. Put the mixture in a spray bottle and spray your kids before they go outside. You can also spray around any sitting areas outside to keep the bugs away. As I mentioned earlier, I routinely use peppermint oil in my everyday life. I love having a 16-ounce bottle of peppermint cleaning solution on hand all of the time, but especially during cold and flu season. I add a half of a cup of white vinegar with 10 to 15 drops of peppermint oil in the spray bottle and fill the rest up with water. You’re ready to wipe down all of your surfaces once you shake it up. My kids used to get upset stomach a lot, mainly when they were younger. I like to make them a tea using a few drops of peppermint oil, a tablespoon of honey, and warm water. They’d drink this tea, and it would help to settle their stomachs. Their nausea would go away, and they’d feel less bloated. I’d feel better as a mom when the kids started to feel better and get back to their usual selves. I was nervous that the peppermint oils would be too harsh on my skin the first time I used it to wash my face. It might have been if I didn’t dilute it with my carrier oil or water first because it’s a potent essential oil. I wouldn’t recommend putting full-strength peppermint oil on your skin. I diluted two drops of peppermint oil with 10 or 12 drops of water before I put it on my face. One of my favorite uses for peppermint oil is a stress reliever. Trying to keep up with all of my kids and their activities along with work can be stressful. I love taking a bath once or twice a week with a cup of Epsom Salts and a few drops of peppermint oil. The smell rises into the air and sinks into my skin for total body relaxation. Aromatherapy is a great way to relax, focus, and lower your stress levels. A peppermint oil aromatherapy mist gives you all of the benefits of aromatherapy simply by lightly misting around your home or designated area. ASUTRA Premium Aromatherapy Mist contains organic, all-natural ingredients that are designed to get you focused and they’re specially blended to give you greater mental clarity. I like to use it as a body mist as by holding it around six inches from my body and spraying it lightly. This is a strong oil, so a little bit goes a long way, and I get the aromatherapy benefits all day long. Having a bottle of pure peppermint oil on hand lets me use it in several different areas of my everyday life. 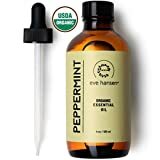 The Pure Peppermint Oil 4 Ounce by Eve Hansen comes in a glass bottle with a dropper that makes it easy for me to measure out how many drops of peppermint oil I need. I can add it to my face wash, into my carrier oil for a muscle relaxant, or around my door and entryways for an insect and rodent repellent. You get 100 percent pure peppermint oil with no additives, dyes, or fillers. It’s steam distilled and unfiltered, so you know you’re getting a high-quality oil. For sore muscles or for stress relief, it’s easy and convenient to use Peppermint Oil Roll On products. This 10mL bottle comes diluted by 100 percent pure coconut oil and ready to be used topically. I like to add a small amount to my wrists for aromatherapy and to my temples to help relieve headache pain. This roll on is certified as being Kosher and Vegan-friendly. It also contains no synthetic additives or chemicals to enhance the oil’s natural potency or scent. This product goes through rigorous product and quality testing to ensure that it’s safe and effective. This essential oil isn’t recommended for people who are pregnant or nursing due to how potent it is. Peppermint oil should be diluted before you use it topically with a ratio of 80 percent carrier oil and 20 percent essential oil. You shouldn’t use peppermint oil on children under two to three years old. Never user peppermint oil on or around your cat. It’s toxic if they ingest it. Test a small area of your skin before you apply the peppermint oil because it can cause contact dermatitis in sensitive skin. Make sure that you’re using 100 percent pure, organic, and premium-grade essential oil. Did you enjoy our list of the six proven benefits and uses of peppermint essential oil? Did your favorite use for peppermint essential oil make our list? Perhaps you don’t see it. Research and studies have proven these peppermint oil benefits, and this makes me feel confident to use it around my family for everything from medicinal and beauty uses to a powerful cleaning agent. Please leave a comment below if you have additional ways that you use peppermint essential oil.